You'll be £19.99 closer to your next £10.00 credit when you purchase Dark Days of Georgian Britain. What's this? In Dark Days of Georgian Britain, James Hobson challenges the long established view of high society during the Regency, and instead details an account of a society in change. Often upheld as a period of elegance with many achievements in the fine arts and architecture, the Regency era also encompassed a time of great social, political and economic upheaval. In this insightful social history the emphasis is on the life of the every-man, on the lives of the poor and the challenges they faced. Using a wide range of sources, Hobson shares the stories of real people. He explores corruption in government and elections; "bread or blood" rioting, the political discontent felt and the revolutionaries involved. He explores attitudes to adultery and marriage, and the moral panic about homosexuality. Grave robbery is exposed, along with the sharp pinch of food scarcity, prison and punishment. It is not a gentle portrayal akin to Jane Austen's England, this is a society where the popular hatred of the Prince Regent was widespread and where laws and new capitalist attitudes oppressed the poor. With Hobson's illustrative account, it is time to rethink the Regency. Dark Days of Georgian Britain has good information in it and is a great reference for writers and readers of the time period! Hobson's running theme through the book is the similarities between then and now. Economic discontent, racism towards immigrants, under employment and low pay and a ruling class only interested in their own wealth. Hobson's book is a good read, entertaining and shocking by turns. Dark Days of Georgian Britain is a great readable antidote to all those costume dramas. A gripping and often disturbing history of the darker side of the Regency. Hobson has found original stories of real people that shine a light on their life… a consciously unromantic book about an era which has been fictionalized as elegant. ...in all respects this is excellent, lively history, written with both passion and compassion. The common image of Georgian Britain is one of Enlightenment, elegance and politeness. Hobson proposes a different angle, which attempts to dispel this romantic version of the Regency, but in fact his book is really a concise history of the poor - and a good one. Based on newspaper sources, he exposes society's dark underbelly in lively accounts of real people's stories. . . ideal for the general reader who wants to know more about the period. A welcome reassessment of what life was like for the majority under the Regency of Prince George. With most people's idea of the Regency being lingering glances across candlelit ballrooms, dashing gentlemen diving into lakes and glittering royal occasions, Dark Days of Georgian Britain throws a bucket of cold water over the romanticised glamour. James Hobson's new release doesn't concern itself with the surface trappings of fashion, but instead peels back the lace and silk to delve into what went on behind the scenes of those who lived through the Regency, regardless of social class. In an era of tumultuous change and upheaval at every level, Hobson strips off the surface glitter and exposes a world in flux, when political and social change redrew the landscape of the nation. Dark Days of Georgian Britain is more concerned with the lives of the masses than the nobility, and it is here that its strength lies. Using a rich selection of sources, Hobson looks at how life played out for those stuck at the lower end of the spectrum. From riots to bodysnatching, famine to the gallows, this is an immersive, accessible history of the everyman in the street. Hobson ably steers the reader through a complex time and frequently draws parallels between the Regency and modern society, bringing the similarities of two centuries ago vividly to life. For those seeking a new angle on a well-represented era, this is a must-read. 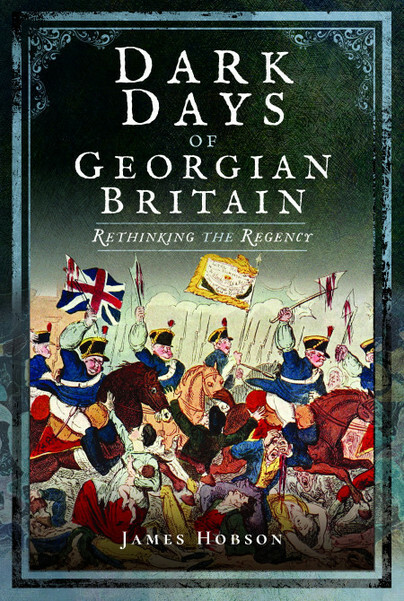 There is much here to enjoy for enthusiasts of the time but the book also serves as an ideal introduction to the issues that shaped the nation as it slipped from the Georgian period into the Regency and beyond. Hobson draws an irresistible picture of a country in the midst of enormous change and the reader cannot help but be carried along for the ride. It is lively, sometimes shocking but, above all, always entertaining. ★★★★ This is one of my recent acquisitions from Alex at Pen & Sword. A box of nine turned up last week. I’ve always found the Georgian and Regency period interesting, too much Jane Austen and Sharpe as a young teenage, I think. The politics and living conditions of the period are what interest me know. This book is comprehensive and fascinating, making connections with the present day. It’s not extensively illustrated but with enough images to give the reader the idea of conditions of the time. The author covers quite a range of subjects from grave robbing to life in a prison hulk, coinage to factory conditions, in details and using plenty of contemporary references to illustrate his points. The writing is easy to read and comprehensible to a non-specialist reader.